​Mark your calendar! 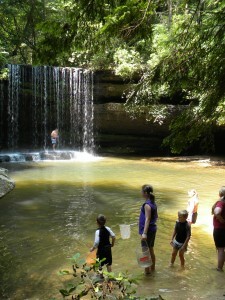 Wild South’s first Wild Wednesday hike of the season in the Bankhead National Forest will be June 28. Hikes will continue each Wednesday through August 2. Meet-up for each hike will be at the Wild South office in downtown Moulton at 9:30 a.m. Return to the office by early afternoon. Wild South’s Wild Wednesday nature hikes in the Bankhead National Forest are opportunities for kids and their adults to enjoy our public lands together. We come to love a place when we spend time in it, and what we love we want to protect. Our hikes teach kids and adults about the wonders of nature, Leave No Trace principles and where families can spend time in stunning wild places on their own and how to do it safely. Hikers’ perceptions of the natural and cultural history of our national forest is broadened and deepened, and a sense of ownership of this place that belongs to all of us is born and, consequently, also the responsibility for its care.